Enjoy a Faster and More Secure Mac. Your one-stop Mac maintenance tool to clean up junks, boost Mac performance, and remove Mac malware and virus. 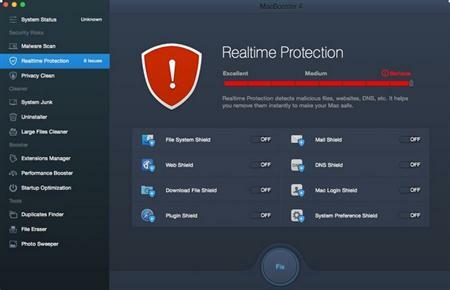 With new MacBooster 4, it provides more powerful ability of cleaning up and protection for your Mac. With new protect module, MacBooster 4 will ensure you a full protection from latest virus,malware & ransomware in real-time before they harm your Mac. It helps you remove them instantly to make your Mac safe. You can easily remove or disable the unnecessary extensions to improve your Mac's performance. With less unnecessary extensions, you can enjoy a better exploring performance and faster webpage loading speed. MacBooster 4 scans every corner of your Mac and safely removes unnecessary files including extra application binaries, old logs, outdated cache files, and more to maximize your hard disk space. This is particularly helpful for Mac users with smaller SSD hard disks. With greatly expanded virus and malware database, MacBooster 4 is the best anti-malware to keep your Mac away from virus, phishing attacks, spyware, malware, and all kinds of online threats while feeling safe about your personal data.